This series hurts. It really does. Not because of the outcomes, getting swept by a team is never good. No, this series hurts because it really knocked my faith in this year's baseball team down a peg or two. You can make excuses all you want: ASU was the #2 team (now #1), the Tigers were a bit rusty from a full week off, first road game, tough road environment, etc. However, those are just excuses. Auburn had a chance to make a huge statement this weekend and we failed. There's no way to sugar coat it. We simply were outhit, out-pitched, out-hustled, out-whatever. Going in to the season, we all knew the pitching would be a problem. Great starts by Cole Nelson eased those fears a little bit. The return of Cory Luckie helped a bit as well. However, when you take off the orange and blue colored glasses, the fact remains: Our Pitching flat out stinks. That's the most troubling issue. It's not just our bullpen, but our starting staff as well. I know it has to weigh on Coach John Palowski, too. Pitching is one facet of the game that he has excelled in teaching, but you can teach all you want, at the very end of the day it's up to the players. You can't blame our bullpen entirely. They haven't come into great situations. Only one Auburn starting pitcher has made it past the sixth inning (Cole Nelson) so we've had to rely on our bullpen early and often. To put it bluntly, our 'pen isn't built to handle roles like that. I honestly think that if we got more quality starts by our starting staff that our bullpen would handle the role just fine. I honestly think they would excel. If we could turn to our 'pen with the lead in the 7th, 8th, and 9th inning or even just being behind 1 run, then I think they could handle that load. We could mix and match better and could manage the game better. Instead, we have starters who can barely make it 5 frames without an implosion. I'm not putting the blame squarely on Jon Luke Jacobs, but it starts with him. He went into the season as the #1 (maybe by default) and hasn't lived up to that billing. He's already lost his weekend spot, so CJP needs to decide whether JLJ goes back to the 'pen full time or if he will just a mid week starter. At the very least, I think its safe to say he's done on the weekends until he can regain his control. I hate it for JLJ and want him to succeed, but I think even he would agree that his role needs to be the role that enables Auburn to win the most games. We have at least 6 starting pitchers: Cole Nelson, Cory Luckie, Jon Luke Jacobs, Grant Dayton, Dexter Price, and Slade Smith. Only 1 of those guys has proven that they can pitch on the weekends, and that's Nelson. The others still have a ton to prove. Personally, my weekend rotation would look like Luckie, Nelson, and Price. I haven't seen enough of Slade Smith to pencil him there. I can't go by hype alone on the kid. I’ll get to see officially what he has on Wednesday when he makes his first career start against Alabama A&M. Smith's an issue that CJP will have to figure out soon. He's already burned his redshirt, so there's no use in holding him. Put him in the fire for these midweek series (like he will on Wednesday)and see what the kid has. As for Price, I think he has the stuff to make a weekend guy he just needs to be put in those situations more. Dayton is the same way. He has the stuff and has the most K power of any guy on our staff. He's just missing his marks when he pitches. So that gets us back (for a bit) to this past weekend. That's where our biggest problem was. Our starting pitching. It just simply imploded. Even Cole Nelson showed he was human having his worst start of his Auburn career and the most inopportune time. I have a sneaking suspicion (and I really hope I'm wrong) that the pitching has started to affect our hitting. The Friday game in particular. 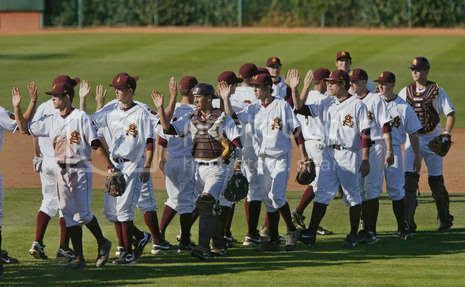 The bats came alive and built a big lead, only to see ASU get it right back. At some point, you wonder if our hitters are thinking "What's the point? 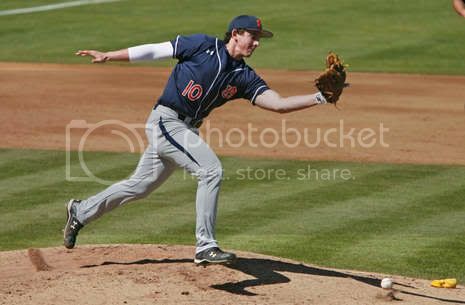 No matter what lead we give, I don't have enough faith that our pitching can hold it.". I'm sure that's crazy talk on my part and I'm just spit balling with this mini-rant but those sentiments are exactly what I was thinking as I listened to the games. One last note on the pitching staff. I think it's time to open our bullpen back up. We've relied on Sean Ray, Austin Hubbard, Bradley Hendrix (who leads the team in appearances), Mike Hurst and Zach Blatt for a majority of our relief appearances. They are a bit overworked. It's time to start sending guys out and giving them a bit of a trail by fire. 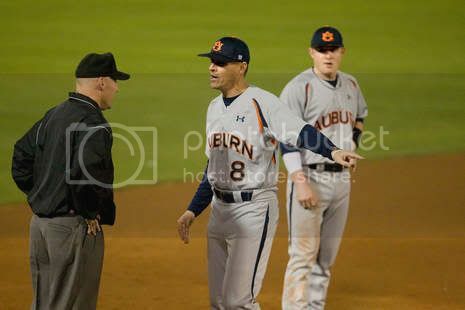 It actually worked this weekend as Chris O'Neal and Garret Bush both made their debuts for Auburn and both pitched better (for an inning at least) than anyone Auburn had trotted out previously (except for maybe Sean Ray who pitched a hell of an outing on Friday, yet still got saddled with a loss because the only hit he gave up in 2 1/3 innings was an unearned run). Bush is a true freshman and that (along with the use of Slade Smith) shows me that CJP is not afraid to burn redshirts if it could help the team. 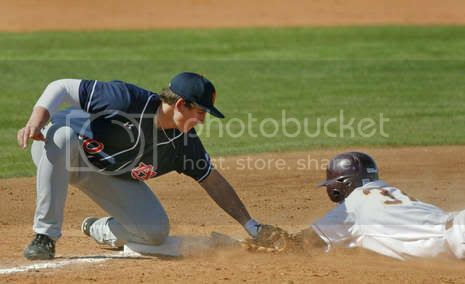 We have 5 pitchers who have yet to see action this season: Brian Houghton, Ty Kelley, Matt Lewis, Miles Morton, and Phil Rossi. Going by my gut, I have to discount Lewis and maybe Miles Morton. Ty Kelley is one guy I know I want to see work again. He's shown that he can be effective in relief if given the chance, it's just seems the confidence may be his biggest issue. Still, the fact remains that these guys need to see the field because it's getting dangerously close to a point where we are just going to have to throw something out there and see what doesn't get hit. Defensively, we still have issues to work out. Namely with Dan Gamache. I'll go into this later, but I think Gamache has completely lost his role at 3B this season. His glove is becoming a bit a liability and I will never say that he's cost us games but those errors have certainly come at some of the worst times. 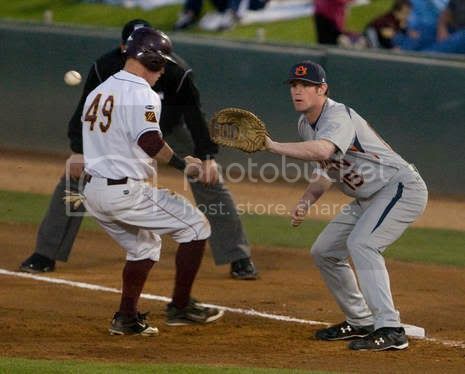 I wonder (and again I'm spit balling) how Trent Mummey's eventual return will impact 3B. When TM returns to CF that will put either Tony Caldwell or Creede Simpson at RF (probably Simpson) and will create an odd man out. Now, Caldwell could stay at RF and Simpson could move to 3B (which he has played before). I just don't know, it's just how I see it playing out. For now, Justin Bryant has shown that he can handle the duties at 3B and at the plate. Gamache does have a role and a key role at that. He's seems perfectly suited as our first pinch hitter off the bench. In fact, he's thrived in these situation. His plate discipline alone makes him invaluable. Offensively, we are more than fine. Especially from what I saw this weekend. 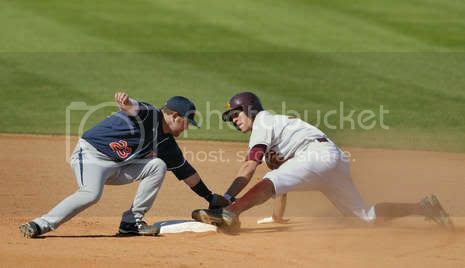 Arizona State had some of the best pitching we will see and Auburn managed to knock them around a bit. 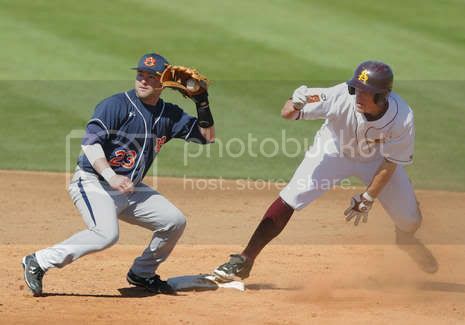 Granted out bats turned ice cold as the series drew on, but some players (like Hunter Morris) still had solid weekends. 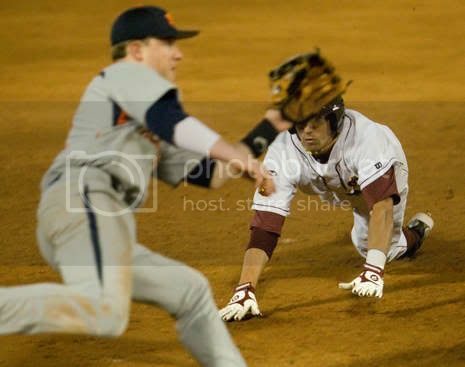 I think our ability to score runs will remain one of the most comfortable facets of Auburn's games. The main challenge for CJP and crew is readjusting and refocusing for SEC play, which starts this weekend at Georgia. This weekend is key. I can not stress how big this opening series is. Georgia is reeling and if we must win this series. I hate putting such a do or die attitude on our opening SEC weekend, but Georgia is down and if Auburn wants to be up then we have to win this series. A sweep is crucial, but I'm a realist and a series win is just as good. I still have hope and faith in Auburn this season. I still have hope and faith in Coach John Palowski. It's just a bit down after the egg we laid against Arizona State. Let's see how I feel on March 22nd and the UGA series is in the books.